After an early morning flight to Athens, we had lunch and visited some historical sites in the city. Then, we had some free time to explore Athens on our own before being treated to a 12-course dinner (courtesy of DIS) that left us feeling fuller that we’d ever felt before! Our second day in Athens was one of my favorite on the trip. We visited the Acropolis in the morning, which was packed with tourists but breathtaking nonetheless. Then in the afternoon, we took a 2-hour bus trip to Sounion, which is the southernmost tip of the Attic peninsula. We spent a couple hours at the beach before visiting the Temple of Poseidon. It was one of the most beautiful places I’ve ever visited, and it was incredibly calming to feel so far away from the fast-paced rhythm of the city. On our last day in Athens, we visited the ancient ruins of the Agora. It was surreal to see the ruins of the streets that ancient Athenians used to roam and the prison where Socrates was executed. In the afternoon, we took a bus ride to Delphi; along the way, we stopped in a town named Livadeia to see the Cave of Trophonius and hike up a mountain to an old Byzantine church. We spent the morning visiting the Temples of Athena and Apollo. The ruins were up in the mountains and although it was a bit cold, the views were incredible. It was quite peaceful to simply “dwell” (as our professors, Brian and Jakob, like it call it) among nature and the ruins–it served as a nice reminder of how small we are in the grand scheme of things. Afterward, we had lunch and drove a few hours to Olympia. We spent the morning in Olympia visiting the Temple of Zeus; a few of us also took a short hike to the top of the Hill of Kronos. After a delicious lunch with what was at least the 5th spanakopita I’d had that week (not complaining! ), we departed for Nafplio. According to Brian, Nafplio is the beach town where Athenians go for vacation, and it was the perfect place to spend our last night in Greece. We spent late afternoon and evening hiking, watching the sunset, sharing a final dinner together, and just hanging out with one another. It was a lovely way to end our study tour–I only wish we could’ve had more time there! On our final day in Greece, a few of us decided to check out the flea market in Nafplio. There were tons of vendors selling fresh produce, honey, olives, clothing, and many other things. I bought some honey for my parents and host family (and sampled some in the process–it was really good!). Plan an itinerary ahead of time: You don’t have to know what you’ll be doing down to the minute, but researching things to do and places to visit before traveling will make things so much easier once you get there. Give yourself time to relax: This is something I wish I’d done more of! We were perhaps a bit too ambitious on this trip (4 cities in 9 days) and while I enjoyed visiting so many places, it would have been nice to stay in one place for a bit longer. Pack lightly: This makes flying easier, and there’s nothing more cumbersome than dragging heavy luggage around before or after you’ve checked out of where you’re staying! Thanks for reading! If you have any questions about traveling (or anything DIS-related), please don’t hesitate to reach out 🙂 Vi ses! Hej! It’s been hard to keep up with my goal of blogging every week, but I wanted to make sure I posted something before leaving for my travel week this weekend. The semester is flying by, which is both exciting and nerve-wracking! Copenhagen has really begun to feel like home. Last week, I helped my friend Amelia host a “hygge dinner” at her homestay. We live in the same homestay network, and DIS gave us money to purchase groceries and cook a meal for people in our network. The dinner was a success (we didn’t burn anything!) and I even had the opportunity to do an Instagram takeover on the DIS account, so check out @dis.copenhagen on Instagram to see more 🙂 (archived under “Housing” stories). Spring rolls we made by hand! Last week, some members of my homestay network and I also went to Tivoli, which is an amusement park right in the middle of Copenhagen. Winter in Tivoli was magical (but cold! )–we rode rollercoasters, drank hot chocolate, and admired all the lights. I can’t wait to go back when it reopens in April! Well that’s all for now – vi ses! Hej everyone! It feels like it’s been a while since I’ve blogged, so I wanted to let you all know what I’ve been up to. 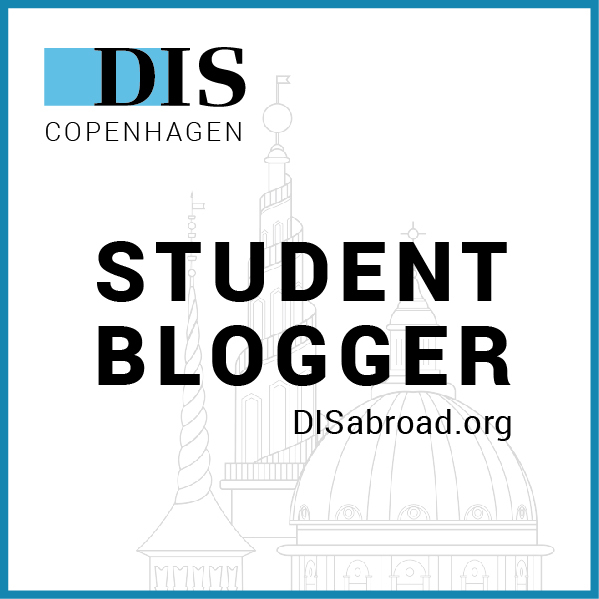 In the past couple of weeks, I’ve been accepted as an official DIS student blogger, crossed a few more sites in Copenhagen off my bucket list, joined the Copenhagen Business School choir, and visited two new countries. Needless to say, it’s been a busy time with plenty of new experiences! I’ve officially been in Copenhagen for one month, which is surreal–in some ways, it feels like I’ve been here for ages and in others, it feels like I just got here yesterday. We had a regular class session in which we discussed Hegel and Heidegger’s views on art. I hadn’t read much of either philosopher’s works prior to this class so it was interesting to explore their philosophies on the function of art. I can’t say I find either of their arguments particularly convincing, but the discussion was valuable nonetheless. We met for coffee at a cozy café before visiting the Glyptotek, which is an art museum in Copenhagen. The vast majority of works in the museum are sculptures, and it was by far one of the most beautiful museums I’ve visited. Our professor, Jakob, showed us a few of his favorite works before giving us time to explore on our own. We were tasked with thinking about how the artworks we saw fit (or didn’t fit) in Hegel and/or Heidegger’s philosophical frameworks. Not much to report from this day–we had an exam in my core course, which wasn’t too bad, and had the rest of the day free. I went home to relax and pack for my study tour before heading to a choir rehearsal in the evening. We left early in the morning for our short study tour to Germany! Every core course goes on a 3-day study tour during core course week, and I was lucky enough to visit two cities in Northern Germany–Hamburg and Lübeck. After a 5-hour bus ride that included an hour on a ferry, we arrived in Lübeck, where we visited a church and museum. At both sites, we were again challenged to think about art within the context of Heidegger’s philosophy. Afterward, we checked into our hotel, ate dinner, and explored the city a bit more before getting some well-deserved rest. After a tiring day of sightseeing, we had a fancy four-course dinner courtesy of DIS! We spent a couple of hours at the Hamburger Kunsthalle, an art museum in Hamburg. The museum was huge and had artworks ranging from medieval to contemporary. After the museum, a few friends and I explored Hamburg a bit more. We stumbled upon another beautiful church and the state parliament building. Finally, we had lunch at the (very fancy) restaurant inside the parliament building before heading back to Copenhagen. It’s my second week here in Copenhagen and my first full week of classes. I’ve been settling in and getting more comfortable with my surroundings–I’m finally able to walk from the train station to my classes without using Google Maps, which is definitely an accomplishment! I thought I’d update all of you on three core aspects of my study abroad experience so far: my host family, new friends, and my classes. My host family has been a wonderful constant in my daily life here in Denmark. I will admit that I was initially hesitant about living in a homestay because of the commute, possible restraints on my independence, and the chance that my host family and I wouldn’t get along. I’m happy to say that these concerns have not been a problem! My host family has been nothing but warm and welcoming, I am treated like an adult, and the commute has actually been quite nice. I live a 3-5 minute walk from the train station and from there, it’s about a 30 minute train ride into the city. I use that time to relax, listen to music, and watch the transition from city to countryside from the window. One thing I was worried about was being isolated from other DIS students. While living in a homestay does mean that you will not be eating and hanging out with your fellow DIS students as regularly as those living in kollegiums, residential communities, and LLCs will, it is a unique opportunity to experience Danish family life. On a typical weekday, I’ll come home from classes around 5, relax for a bit, help my host parents make dinner, eat and talk for an hour or so, and then watch TV together (anything ranging from Black Mirror to the handball world championship). DIS also does a good job of connecting homestay students through homestay networks. My network had its “jumpstart event” this Saturday. Each family brought a homemade cake and we spent a couple hours talking and getting to know one another. So much cake! The one with the Danish flags was a carrot cake made by my host mom. There are at least 20 other students from Smith studying abroad in Copenhagen, but I’m not close with any of them. It seems like a lot of people here are studying abroad with friends from their home schools, but I think an important part of studying abroad is to leave your comfort zone and meet new people. My homestay network has been great–this weekend, we visited Christiania together. Christiania is an alternative community in Copenhagen that was founded in 1971 in an abandoned military area. The residents have their own community rules and are somewhat autonomous from the government. The community is open to visitors and was really cool to see. All of my classes have been really interesting so far! The academic setup here isn’t too different from what I’m used to back at Smith–the classes are relatively small and tend to be discussion-based. A great thing about DIS classes is that they all have a field study component! I had my first field study yesterday for my Health Economics class. We visited Danske Regioner (Danish Regions), which is the interest organization for the five regions in Denmark (similar to the states in the U.S.). We were treated to coffee & croissants and listened to presentations about healthcare lobbying and ongoing changes to the hospital system in Denmark. It was interesting to learn about the Danish healthcare system and some of the healthcare policy debates currently taking place in Denmark. I took a red eye flight from JFK to Copenhagen and landed at around 12:30 pm. After breezing through customs and baggage claim, I went across the street to a hotel where DIS staff greeted us and led us to a room where homestay & rented room students had a short orientation. Afterward, we all anxiously awaited the arrival of our host families. After waiting for about 30 minutes, one of the DIS staff members called my name and I went into the lobby area to meet my host family! The family consists of my host dad Morten, my host mom Mette, my 18-year old host brother Mads, and my 21-year old host brother Martin (who no longer lives at home). They are all very sweet and make me feel at home! Their house is in a small town called Nivå, about a 30-minute train ride north of central Copenhagen. I have my own room, and the house is very cozy, minimalist, and hyggeligt. I had a much-needed opportunity to sleep in. After a refreshing 10 hours of sleep, my host family showed me how to take the train to Copenhagen and showed me around the city center. We got coffee at a market in the city center and found some of the DIS buildings before heading back home and relaxing for the rest of the day. First day of orientation! I had to wake up early to make it to an 8 am opening ceremony, where we heard from the executive director of DIS, some former DIS students, and a Danish singer named Elisha. Afterward, some friends from my homestay network and I went to Studenterhuset, a student-run café for students attending school in Copenhagen, for a free chocolate croissant. In the afternoon, I had a housing workshop with the other students in my homestay network. DIS does a great job of connecting homestay students living near each other by organizing an event at the beginning of the semester for us to get to know each other and providing funding for group activities. More orientation! I went to the Danish Immigration Ministry to get my biometrics taken for my visa, hung out at a cozy café called The Living Room, and attended some orientation workshops in the afternoon. Unsure which building this was but it was beautful! Hej everyone! My name is Dana and I’m a junior at Smith College in Northampton, MA. At Smith, I study philosophy and government, and I’ll be taking the Religious Mythos & Philosophical Logos core course at DIS this upcoming semester. I’m originally from Queens, NY (aka the best borough in NYC!) and therefore have strong feelings about public transportation and good Asian food. My previous international experience has been quite limited. However, I had the incredible opportunity of participating in a month-long study abroad program in India last winter break. It was the experience of a lifetime and fueled my desire to spend a semester abroad! I just returned home today after one of my most stressful semesters so far and finally have time to think about what expectations I have of my semester in Copenhagen. It seems best not to go in with any expectations, however, as many of my most memorable experiences have been unplanned. Nevertheless, I hope to push myself out of my comfort zone, make new friends, spend time with my host family, and learn about Danish culture. I also want to avoid viewing Denmark as a utopia (as I’ve heard others call it). I admire Denmark for its free healthcare, education, etc., but realize that it is very ethnically homogenous and has recently come under scrutiny for some of its policies regarding immigrants. Ultimately, my point is that I want to appreciate the many wonderful things Denmark has to offer without idealizing it to a fault. It’s hard to believe that just three weeks from today, I will be boarding a plane to spend the next four months in Copenhagen. I can’t wait!